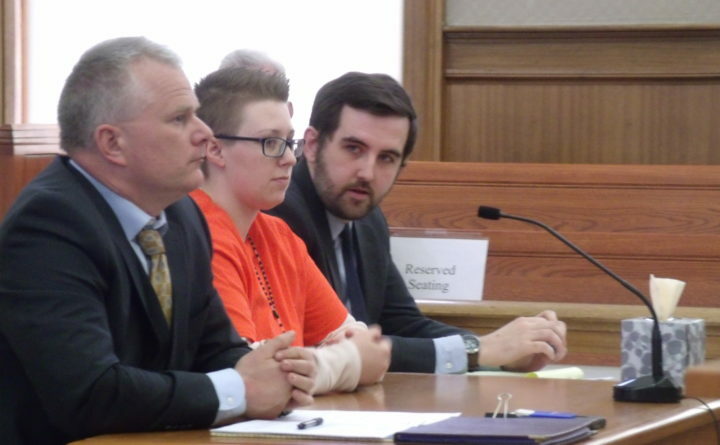 Tia Leigh Ludwick, 26, of Leominster, Massachusetts, center, is flanked by her defense attorneys Stephen Smith, left, and John Tebbetts in Houlton Superior Court on Wednesday, April 18. Justice Harold Stewart II sentenced Ludwick to serve 17 years for her role in the killing of her cousin Douglas Morin Jr., 31, in Oakfield two years ago. HOULTON, Maine — A Massachusetts woman will serve 17 years in prison for felony murder in connection with the killing of an Oakfield man in a drug-related robbery nearly two years ago. During compelling statements from family members in Houlton Superior Court on Wednesday afternoon, the victim’s sister described the impact the killing had on her and her young daughter and asked Justice Harold Stewart II to hand down a life sentence. The victim’s father later stated that the final sentence was “probably fair” to all involved. Tia Leigh Ludwick, 26, of Leominster, Massachusetts, pleaded guilty to felony murder and robbery on Feb. 15 in Aroostook County Superior Court in Houlton in the death of her cousin, Douglas Morin Jr., 31. On Wednesday, Stewart sentenced Ludwick to 22 years in prison with all but 17 years suspended, to be followed by 4 years of probation. He also ordered she serve a concurrent sentence of 15 years on the robbery charge. Once on probation, conditions require that Ludwick not consume drugs or alcohol, have no contact with the Morin family, and undergo substance abuse and mental health treatment. Ludwick is one of three Massachusetts residents that an Aroostook County grand jury indicted in November 2016 in connection with the fatal shooting of Morin, whose body was found on Oct. 16, 2016, in a vehicle on PD Road in Sherman. Ludwick; Darin Goulding, 32, whose town of residence in Massachusetts was not listed; and Marcus Asante, 22, of Fitchburg, Massachusetts, were charged with murder and robbery in the incident. Goulding pleaded guilty in February to robbery in exchange for the state dismissing the murder charge if he agreed to testify against Asante. The state alleges that Asante is the one who pulled the trigger. Asante is scheduled for trial in November, after which Goulding will be sentenced. Assistant Attorney General John Alsop said during Ludwick’s plea hearing in February that if the case had gone to trial, testimony would have shown that Morin was shot twice in the back of the head. The prosecutor said that he would have shown that Morin was planning to meet people in order to sell marijuana. The man who had supplied Morin with the marijuana would have testified that he had seen Ludwick in a red car, according to Alsop, and texts found on Morin’s phone matched texts found on a phone belonging to Ludwick and her boyfriend. Alsop said during Wednesday afternoon’s sentencing hearing in Houlton Superior Court that Ludwick “was going to steal marijuana from her own cousin and as a direct result, Douglas Morin was killed. The state requested that Ludwick spend at least 25 years in prison for the crimes, while Ludwick’s attorneys asked that she serve no more than 13 years. In court on Wednesday, Morin’s mother, Debra Morin of Oakfield, described a life of heartache since the death of her only son. Danielle Morin requested that Ludwick be sentenced to life in prison. Morin’s father, Douglas Morin Sr., also described a “big hearted” son who survived getting struck and severely injured by a car when he was a child and who overcame an accident that left him nearly blind in one eye. He said that his son and Ludwick grew up together and that he could never have imagined anyone harming his son. “Please have mercy on her,” she requested of the judge. Ludwick’s defense attorney, John Tebbetts, said his client was remorseful and had been self-medicating with drugs to treat her bipolar disorder. In sentencing Ludwick, Stewart noted that Ludwick “organized and planned” the crime. Stewart said he felt that Ludwick was a good candidate for probation, had no criminal history and had accepted responsibility for the crime by pleading guilty.